Vampires! Powerful, ravenous and immune to the ravages of time! 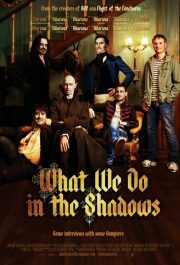 Rather unfortunately for Viago ( Taika Waititi) , Vladislav (Jermaine Clement), Deacon (Jonathan Brugh) , and Petyr (Ben Fransham), the undead subjects of 2014’s mockumentary What We Do in the Shadows , vampires also seem to be immune to the Flynn Effect. Everyone around them is getting smarter decade by decade, but they remain in a perpetual state of vague befuddlement. The quartet share a house in Wellington as well as a daily struggle to deal with the baffling modern world. But change is coming. Change in the form of the human known as Nick.